In John Carpenter’s “The Thing”, the cold is not only a force of nature, it’s a grotesque animal in and of itself. Adapted and updated from the 1950’s Science Fiction classic “The Thing from Another World,” Carpenter’s retelling not only remains more faithful to the story’s literary origins (“Who Goes There” by John W. Campbell), but constructs a terrifying master class in paranoia and human nature. Part “Invasion of the Body Snatchers,” part fucked up Agatha Christie hybrid, “The Thing” sets its action in the blistering cold of the Antarctic and not-so-subtly against the back drop of the actual Cold War. Set on an American Research Station in the Antarctic in 1982, “The Thing” takes a fairly rote Science Fiction concept and invigorates it with both alarming relevance and grim timeliness. Rising above its own premise time and time again, it has this constant atmosphere of nagging suspicion. Amongst the film’s many attributes is the way that it mines genuine terror from a high minded premise that uses both its gore and clinical nihilism to find this unique meeting point between genuine dread and constant intrigue. This crossroads between genres and its ultimate success is not only a testament to Carpenter’s impressive control as a film maker, but also to the film’s players. 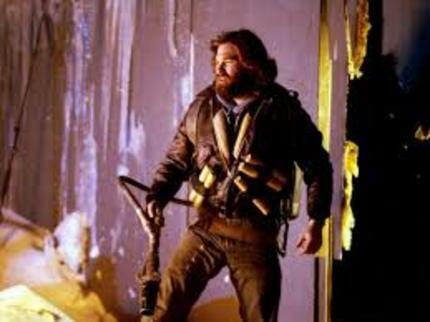 Led by the inimitable Kurt Russell (noting the second in what would be a largely successful string of films with Carpenter), the ensemble of “The Thing” deserves as much of (if not all) the credit as its central story. Standouts like Keith David and the great Wilford Brimley help round out the tightly-wound cast with both control and focus. Throughout the film, the enemy can simultaneously be anyone, everyone or no one at any given time. Carpenter uses the isolated setting to his advantage at every turn, stranding our heroes on an island of ice as we watch them struggle for footing. Uncompromising and unsympathetic with its approach to logic, “The Thing” makes for both a remarkably engaging mystery and a memorably disturbing allegory. And, once again, it is that mixture in tone that elevates the film to the classic status in which it resides. As the central story plays out, there is such a visceral demonstration of palpable horror on display. Despite the fantastical setting, there’s this feeling of real world stakes that grounds the action in the midst of two worlds; both amongst the outré and the authentic. This is a fascinating balance to watch pulled off in such subtle, yet accomplished fashion. Ultimately, “The Thing” isn’t interested in final solutions or permanent answers. This speaks to the film’s inspired nature. Its bitter existence as biting as its frost-bitten setting, there is a nihilistic bent to the proceedings that latches onto its legacy. However, its cynicism is met equally with an exhilarating sense of itself, as if frozen in time awaiting for a monster to be discovered.